Motorcyclists now have to pay to park in London's West End as new regulations come into force. The £1.50 daily fee coincides with the introduction of hundreds more motorbike parking bays in central London. Westminster Council said the changes were needed to meet an increased demand for motorcycle parking following the introduction of the congestion charge. 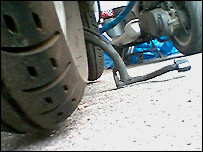 As part of the measures new security stands are to be installed to help reduce motorbike thefts. The number of parking spaces for motorbikes in central London has increased from 4,500 to 6,400. Motorcycle bays have also been converted into designated parking places for bikes, to prevent other vehicles parking in them outside of restricted hours. Hundreds of motorcycle bays have been created in the council's car parks. Jeff Stone, of the British Motorcyclists Federation, said while the organisation had campaigned against the charges, bikers were still getting a good deal. He said: "The general feeling seems to be, if we are getting more opportunity for parking spaces, then we don't mind paying for a spot. "Ideally we wouldn't like charges but on balance we don't pay the congestion charge and they are cheaper to run, so it's still not a bad deal." Riders can pay a discounted season fee or use the Pay by Phone system to pay the charge which will be introduced across the borough gradually, starting in the West End. There will be no extra charge if a bike is moved to another bay. The council said any surplus revenue raised from the charge would be used to help pay for other transport projects in the borough. On average about 16,000 motorcyclists ride into central London every day, up 40% from 10 years ago. This increase is seen as being largely due to the introduction of the £5 congestion charge in February 2003, which has since risen to £8 a day. Any way out of parking hell?